If you’re just leaving or have already left the armed forces, transitioning into civilian life can be difficult. However, it is also an opportunity to hop into some of the newest career fields. 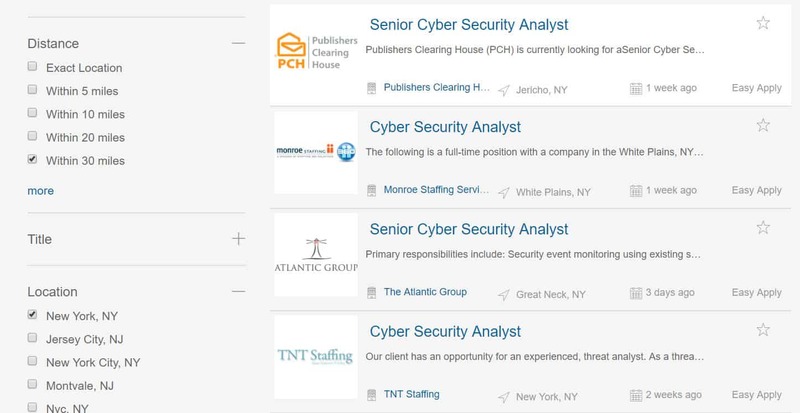 One are to consider is cyber security jobs. Among all of the computer science and computer engineering fields, cyber security is among the fastest growing with the most job options available for anyone, especially for veterans. According to the U.S. Bureau of Labor Statistics, jobs in “Information Security” have a 28 percent growth rate into 2018. This is considered “much faster than average,” given the BLS puts the average growth rate for all industries at 7 percent. For all intents and purposes, cyber security jobs are the place to be for veterans who want job security in a computer science field. And regardless of whether you want to go into the federal government contracting or in move into the private sector, there’s likely a job out there for you. The biggest question for any veteran, however, will be where to start and how to get connected. This guide will provide a few quick tips for those already in computer science fields looking to get started in cyber security. For veterans, getting started in cyber security means assessing your current training and skills against what you’ll need to know in order to land your first job. You may have a degree, training, or a security clearance that are already attractive to potential employers. But taking stock of what you can use to sell yourself on the open market is a good way to know judge your own strengths and limitations. Before looking at what training you’re going to need, it’s a good idea to consider what skills or training already makes you marketable. It’s a good idea to compile a list of specific training and coursework you complete while the armed forces, and then consider how that might make you marketable in a cyber security job. For example, if you did Computer Systems and Programming for the Air Force, your background in practical computing and IT applications makes you a good sell to potential employers. You may still need to acquire some additional skills and take some additional coursework. There’s a good chance you could land a job without further training and get paid to acquire the additional skills a potential employer needs. Meanwhile, even if you were serving a non-technical role in the military, you may still be a valuable hire due to your security clearance alone. While many cyber security jobs are with private companies trying to protect their own assets, a growing number of private companies contract with the federal government to provide these services. And in those cases, a security clearance is required to work on federal contracts. If you already have one, even at a minimum level, you are likely a far more attractive hire. As you likely already know, security clearances can take some time to acquire. Military personnel are often ahead of the line in acquiring these clearances and do not have to pay the cost of the investigation and clearance. However, companies that want to obtain a security clearance for their employees are going to have to wait. 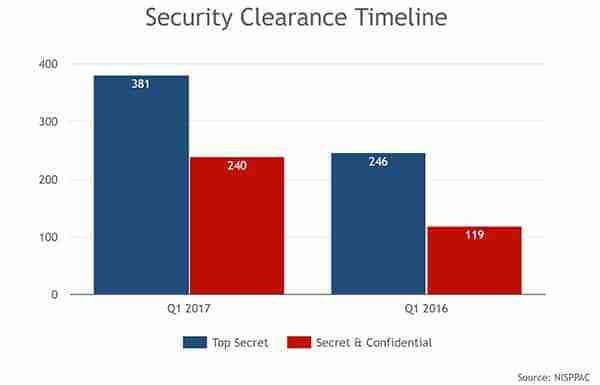 There’s currently a security clearance backlog in the U.S. More than 700,000 people are waiting to get security clearances. The backlog is so bad it’s prompted federal investigations. And for those that do acquire a security clearance, the normal wait time is still long. According to ClearanceJobs.com, a Top Secret security clearance averages 545 days to acquire, while a Secret level security clearance averages 288 days. Unfortunately for businesses and civilians, those clearance times have only been increasing as more people are working to acquire clearances even among the growing backlog. And it’s not just the time it takes that’s the problem. Security clearances are also expensive to obtain. A Secret clearance can cost $3,000 for a company to acquire, per employee, while a Top Secret clearance can cost between $3,000 to $15,000. All told, if you have even a Secret clearance or higher, you’ll likely save any potential employer both time and money, allowing you to get started on the task much sooner. The cost that your employer would pay toward acquiring your security clearance can be shifted to skills training. Many employers are looking only for those who already have a security clearance, making you more valuable, especially now. It’s always a risk to shoot into the dark blindly. To help manage your career change with some deeper insight, it’s a good idea to call around to potential employers and see what they think of your current skill set and whether what you currently have is potentially valuable to them. Once you know what potential employers are looking for, and how well you would do in the job market as-is, you’ll want to start exploring classes and certifications that you’ll need to enter the cyber security market. Even if you have a security clearance and some training, you may still lack the kind of coursework a potential employer is looking for. And while a future employer may help pay for specialized classes and training, you may need to consider outside coursework and training first to make yourself a more attractive hire. As cyber security contains a large number of different fields and career paths, it’s a good idea to focus, at first, on the prerequisite coursework and certifications that are considered standard across all cybersec fields. Microsoft Technology Associate (MTA) in IT Infrastructure: Microsoft’s IT infrastructure course that covers prerequisite knowledge on desktop, server, and cloud computing infrastructures. 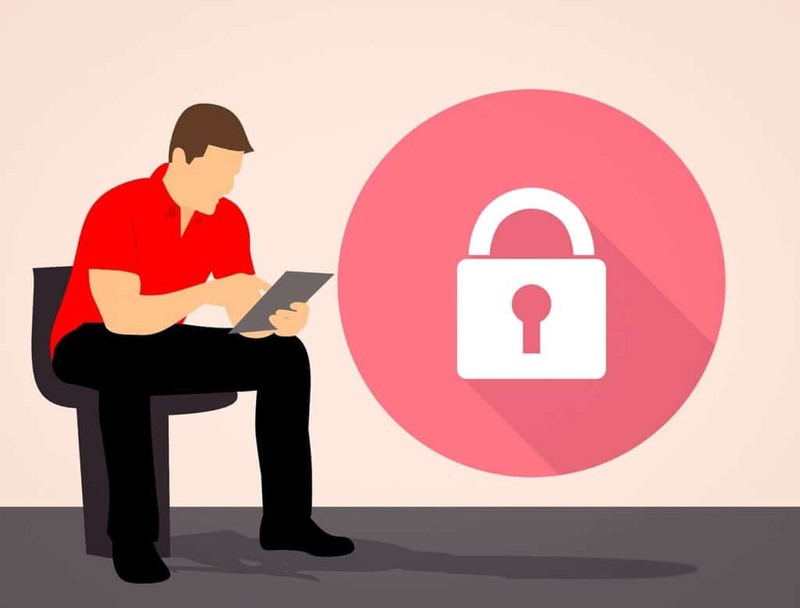 At a minimum, many cyber security jobs will require you to have much of the CompTIA and Cisco coursework completed in order to be considered. Even if you’re not sure what area you want to specialize in, a few CompTIA and Cisco certificates (which can be difficult to obtain) will help potential employers know you’re a good investment. Outside of getting a potential employer to pay for coursework or paying out of pocket, there is one key program designed to help veterans transition into cyber security roles. Veterans can take advantage of free job training in cyber security. This initiative, which is a part of the Department of Homeland Security, offers up a few options. The Federal Training Virtual Environment (FedVTE) is the primary option for veterans looking to get cyber security coursework completed. There are more than 800 hours available through this online system, and it’s free for veterans and government personnel. You can find course work in ethical hacking, risk management, malware analysis, and more. According to the DHS, coursework is aligned to the National Initiative for Cybersecurity Education (NICE) Cybersecurity Coursework Framework. …and more! There are dozens of classes available that can help satisfy some of the most pressing needs that potential employers might have, and can help save you thousands of dollars in costs. Additionally, as a veteran, your access to this free coursework may make you a good hire for a company looking to help someone attain the requisite skill set at a low cost. And since these courses are not available to anyone but veterans and government employees, you’ll be at a distinct advantage. There are training options and classes outside of FedVTE. However, given the expansive amount of coursework available and the fact that it’s free for veterans, other options are not going to be as valuable to you. 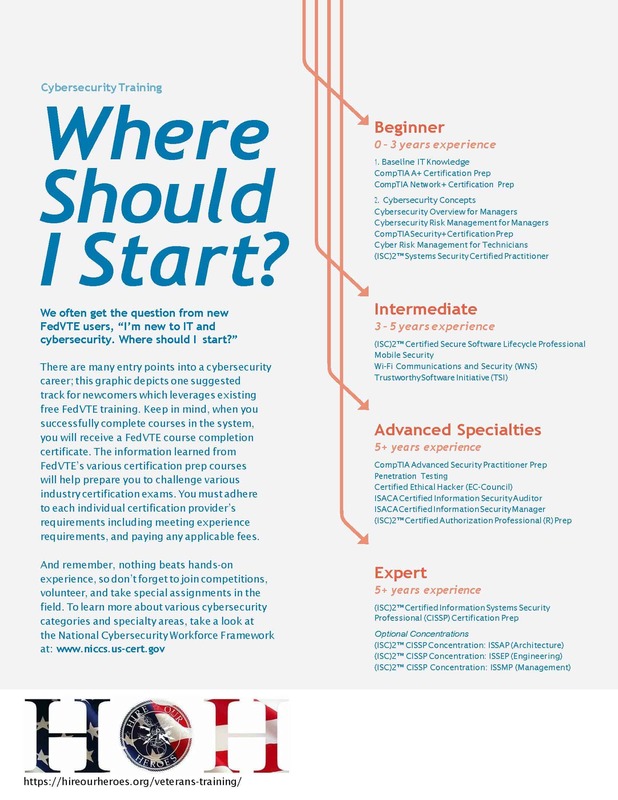 That said, you may still want to consider going back to school to obtain a 4-year or 2-year degree in cyber security. If you still have G.I. Bill benefits to use, obtaining a degree is a worthwhile place to spend it. Beyond obtaining the requisite coursework and hedging your current skills, you will want to get involved in the cyber security community to keep up with what’s happening. Having the proper knowledge of current trends and thoughts from experts will help you maintain high standards and help ensure potential employers see you as a good fit. For more, we recommend checking out our guide on getting started in cyber security, where we cover the best books and best online communities to follow. Are you a veteran who’s successfully transitioned into a cyber security field? Let us know in the comments! We’d love to hear about your experience transitioning from the armed forced into a cyber security profession. And if there are any important steps that we missed, let us know! Cybersecurity has become an important part of our lives. We must make more effort to feel safe.